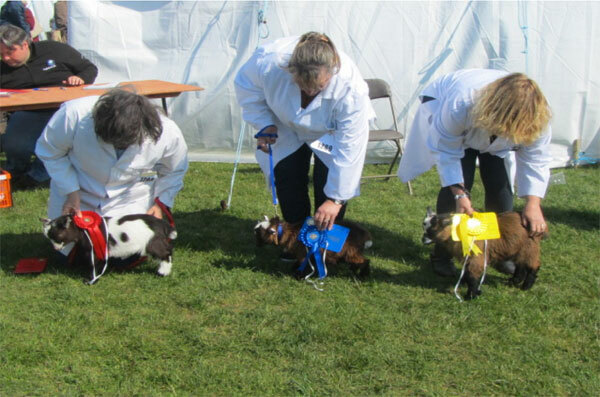 Goat keepers attend shows for a variety of reasons. For some it is simply a pleasant day out, giving them a chance to meet up with friends and to chat about ‘goaty’ topics as well as things in general. Others see it as an essential opportunity to provide a shop window for their stock. Pet owners as well as breeders are proud of their animals and welcome the occasion to be able to show them off . Whatever the reason/s it certainly adds another dimension to pygmy goat keeping and once experienced, it often becomes a lifelong pursuit. 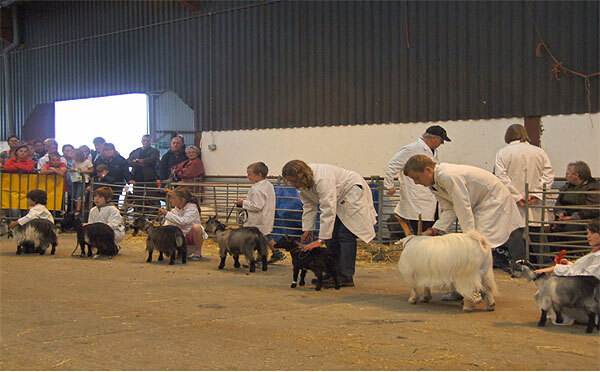 Having made the decision to get involved in the show scene, the first thing is to find out where the shows are that actually have classes for pygmy goats. 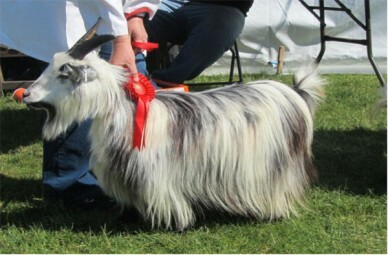 These can be obtained from the Pygmy Goat Show Secretary email: shows@pygmygoatclub.org. Tel: 01409 241 993. 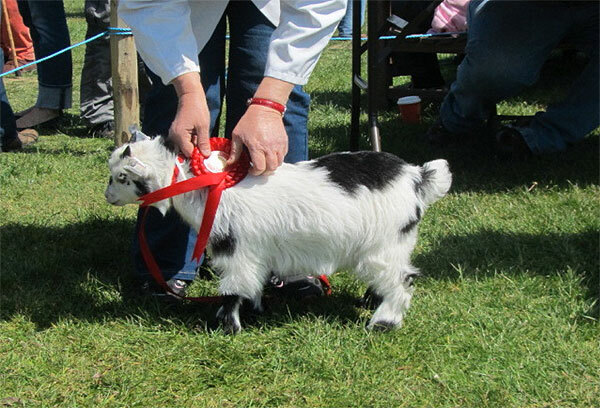 To enter the PGC recognised shows exhibitors have to be members of the Pygmy Goat Club, but there will be many shows on the list where this does not apply. However, it would be a worthwhile thing to do, for a multitude of reasons. Classes offered vary from show to show. Much depends on the size of the show, the time of year and whether it is what is referred to as a recognised show i.e. 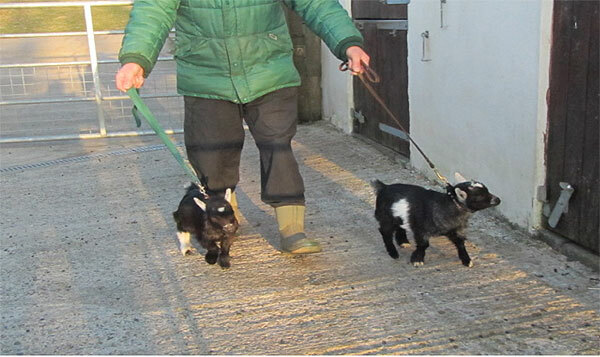 an official show of the Pygmy Goat Club or not. Generally speaking, there is a Breed section and a Pet section. The Breed section comprises of classes for registered breeding stock and the pet section for non-breeding animals i.e. castrated males (wethers) or females with either mouth faults or teat faults. This section is also open to unregistered breeding or pet females without any specific faults. The schedule for each show will make the definition of classes clear. Contact the secretary of the show for a schedule and fill in the entry form, returning it by the stipulated date. If in doubt about which classes to enter your goats, the secretary will be only too pleased to advise. If possible, attend a show or two beforehand to meet some of the exhibitors and also to familiarise yourself with show procedure. The vast majority of exhibitors will willingly chat ad infinitum about their stock or about aspects of showing. Don’t though, decide to engage them in conversation when they are either preparing their animals to enter the ring or are on their way! The best time would perhaps be after the show has finished when there will be more time to talk. Most exhibitors new to showing begin with a couple of kids, be they future breeding stock or just pets. They will have to be 8 weeks of age to enter the show. Having visited at least one show previously, it will be a source of comfort to discover that young kids do not always behave well in the ring, especially at the beginning of the season. This is understandable and will be appreciated by the judge. At least four weeks before your first show date, begin to accustom your youngsters to walking on a collar and lead. A small collar and a quite light, longish lead is the best for training, as it gives your kids a chance to jump about and let off steam initially. Be patient, don’t rush them and certainly don’t keep them on the lead for too long at first. About five minutes per day is probably sufficient for the first two weeks or so, then gradually increase the time. Little and often is the way to go. Some kids take to it like a duck to water and will walk along quite unperturbed almost from the beginning, whilst others will scream, pull and yell as if being slaughtered. If possible, take them out of ear-shot from their mother/s before starting their training. Believe me, it will become less of an ordeal as time and practise continues. One thing for certain, the vast majority of kids will be less than perfect when in the ring for the first or second time. Another thing to practise is presenting the rear end of the kid to face the judge. Do not spread the back legs out beyond the line of the hocks. Place them naturally below the hocks. The last thing to practise is what we call ‘standing the goat up’. 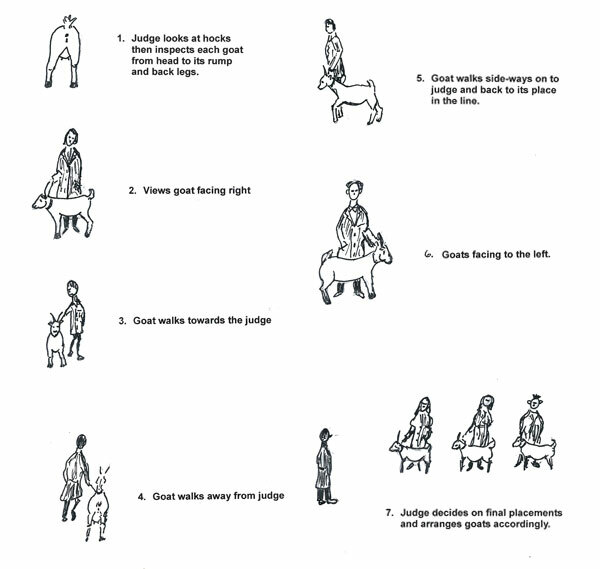 The judge will want to see your goat sideways on, first facing in one direction and then eventually in the other. Make sure that your goat is in front of your body facing sidewards, then with your hands on its rump, move the back legs so they are exactly opposite each other. Put your hand between the front legs and lift them off the ground until they are again exactly opposite one another. Now all of its legs should be ‘four- square’. Easier said than done initially but it will come once the kid begins to relax and get the message. Youngsters are far from perfect to begin with, in the ring or outside it. Just ‘keep calm and carry on’ as the saying goes! Should you have bought older goats to start with, the method of training them for the show ring is basically the same as for young kids. However, the likelihood is that older goats may well have been previously shown, so the concentration would then be on getting yourself ready rather than the animal. Having prepared your goat for the show ring, it now needs to be given a bath, have its hooves trimmed and be well brushed. Use animal shampoo, otherwise it will require litres of water to get rid of the foam. Livestock tea tree oil shampoo is excellent. If possible choose a nice warm day for bathing, ideally a couple of days before the show to give the coat time to settle. Towel dry and comb the coat into place, otherwise it tends to look as if it has had a ‘bad hair day’. Hair driers can be used, but, especially at the beginning of the season if the weather is wet, cold and windy, best to forgo bathing and rely purely on a good brushing. Show leads and collars. Every-day ones can get to look rather tatty. Hoof trimmer in case the hooves require a final trim. A bottle of baby oil and a small soft cloth to rub the oil into the goat’s horns before taking it into the ring. Brush and comb. A dog brush with spikes on one side and a normal brush on the other is most effective. In very hot weather it is advisable to include a sachet of lectade (replacement salts) and a 50 ml syringe, just in case your young kids become a little dehydrated. Follow the instructions on the sachet for mixing the powder. Seek out a vet if you are not sure. Although, in fact, dehydration rarely occurs it’s better to be safe than sorry. Keep your schedule, catalogue, class numbers and a safety pin (or similar) to attach the numbers to your white coat, together in your grooming kit. Write on the back of each number the class that the number refers to and the name of the goat entered under that number. Doing this saves a lot of time and confusion if done in advance. Some secretaries will have done this for you before handing out the numbers. There is absolutely no need to alter your feeding regime before shows. Just feed your animals as normal. Certainly don’t increase the amount fed as the majority of judges do not appreciate obese goats. Make sure that there is a bucket of water available in each pen, although goats seldom drink much water when at a show. Each pen requires a hay rack. 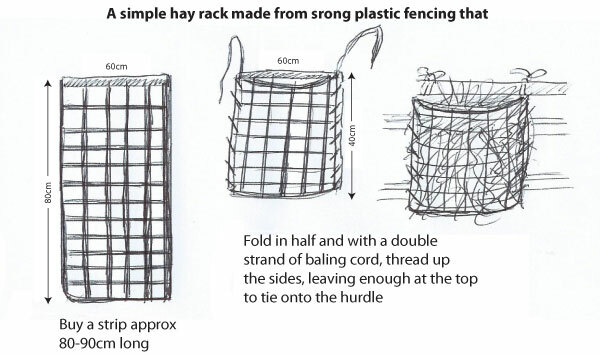 Do NOT use hay nets as young stock can easily become tangled up in them. A simple mobile rack can be made from strong plastic fencing that can be bought at most garden centres. Before attending a show, an AML (Animal Movement Licence) form, duly completed, will be required to be handed in on arrival. Another will accompany your homeward journey and has to be sent to your local Animal Protection Office within three days of arriving home. These forms are very simple to complete and should not be a deterrent. Your Trading Standards Office will usually provide you with them or will tell you who to contact. Some keepers with only a small number of animals, arrive at shows with their stock in the back of a van or estate car. Strictly speaking, this is illegal, as all livestock should be transported in livestock trailers. If transporting your goats is a problem, contact the show secretary , who may well be able to put you in touch with another exhibitor who lives close by and will have room to accommodate your goats as well as their own. Well worth a try. Having arrived, you will be directed to your allocated pens and given your goats’ class numbers. A catalogue, which is sometimes provided but sometimes has to be bought, will tell you exactly what classes your goats have been entered in and their relevant numbers in each class. Before entering the ring, having donned the compulsory white coat, make sure that the number that you have pinned on your coat is the correct one for the class. Then enter the ring where the steward will direct you to your place. It is a matter of following the steward’s instructions, as he/she will direct you through the set procedure, step by step. It you have practised walking your goat on a lead, turning its rear end to face the judge when instructed and turning it sideways on so that it stands ‘four square’ again when instructed, then you are home and dry. It is now just a matter of waiting for the judge to decide on where you will be placed in his/her final line-up. It is worth preparing well before your first show. The better prepared you and your goats are, the more confident you will be. Remember that no one is perfect initially and that all newcomers naturally feel a little apprehensive. Once in the ring, time will fly and by the end of the procedure, you will wonder what all the fuss was about. Everyone is only too pleased to help in any way they can. Keep at it, don’t be discouraged if things don’t go according to plan straight away. It is all a matter of experience so be patient. Above all and most importantly, relax enjoy the day: friends made at shows frequently last a lifetime.